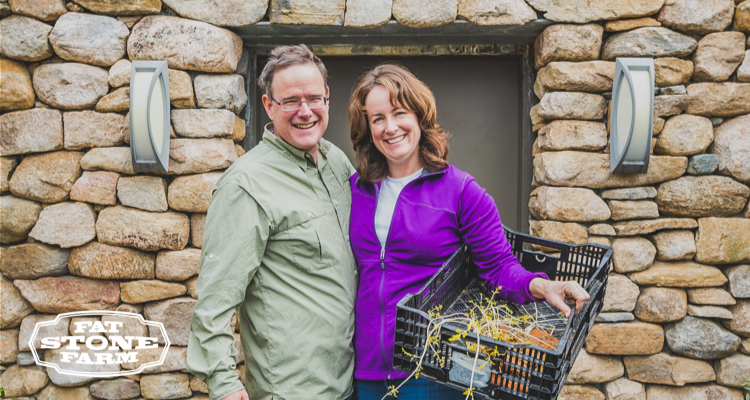 Year round Liz and Bill Farrell, a husband and wife team, work the dirt at Fat Stone Farm in Lyme, Connecticut with their two kids. After making the move from cubicles to the great outdoors, the Farrells realized they loved growing fresh food, and creating healthy, farm-grown products ranging from elderberry apple shots to their own maple syrup. Now—when you think of a typical farmer’s marketing strategy—you might picture a hand-painted sign at a local market, but Liz and Bill run a digital elderberry empire. The couple started as Shopify merchants and then partnered with digital agency Webistry to take their business to new heights. They wanted to see better return on ad spend, and prepare for winter (their best sales season of the year). Lower cost-per-acquisition from $145 (at its highest) to just $1.55(!) for the company’s Elderberry Apple Shots and DIY Gummy kits. Increase return on ad spend for their Elderberry Apple Shot campaigns from 1.66X to an incredible 33.12X. Deliver a cost-per-lead for a sweepstakes campaign of just $0.51. See sweepstakes conversion rates from ad click to entry of up to 79.55%. And garner Facebook relevance scores of 8s and 9s. Overall, with Webistry’s help, Fat Stone Farm tripled ROAS in just five months (December ‘16–April ‘17), and—via continued optimizations—reached returns of 33X over a year and three months. Here’s their epic ecommerce story, and the paid media tactics that could work for you too. 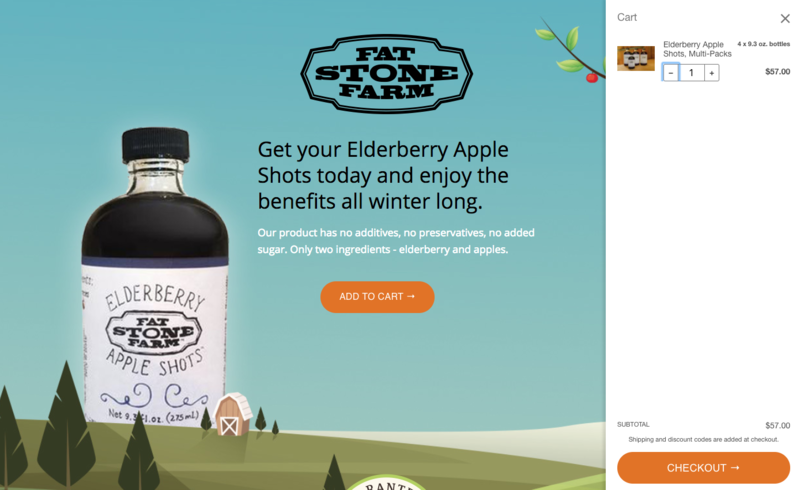 Historically, sales of Fat Stone Farm’s Elderberry Apple Shots go up in winter to help fight off flu season. So in early winter 2016, Bill and Liz approached Jonathan Naccache, Co-Founder at Webistry to prep some advertising. The agency discovered that they couldn’t look to AdWords for a huge win. The search volume for elderberries or related products wasn’t super high, and this approach simply wasn’t scalable. 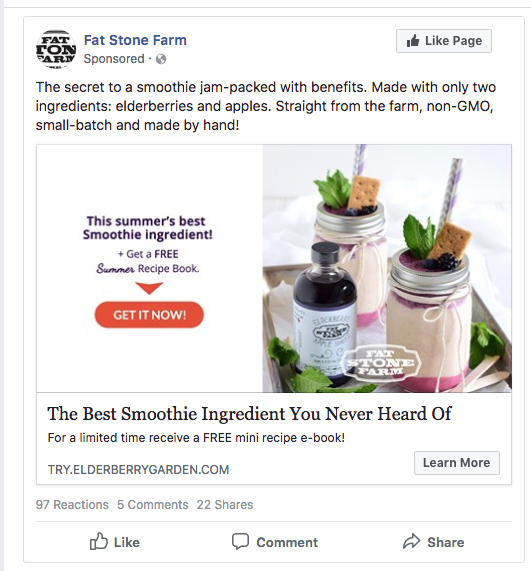 Instead, they needed to generate extremely targeted custom audiences on Facebook (which can be difficult because prospects on Facebook aren’t necessarily screaming about their love of elderberry – these prospects need to be uncovered). 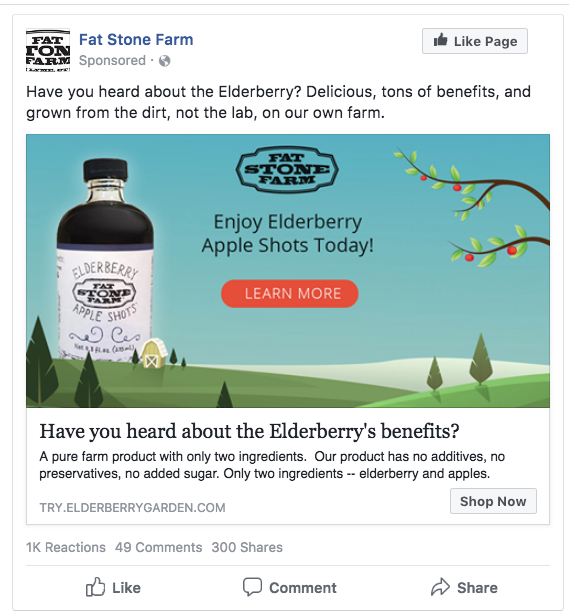 In Webistry’s approach, each ad campaign would target a group of interests that could coincide with elderberry products. They’d target Facebook users who’s interests included: alternative medicine, natural remedies, homesteading, or those engaging with popular health blogs like Mother Earth News and Wellness Mama. 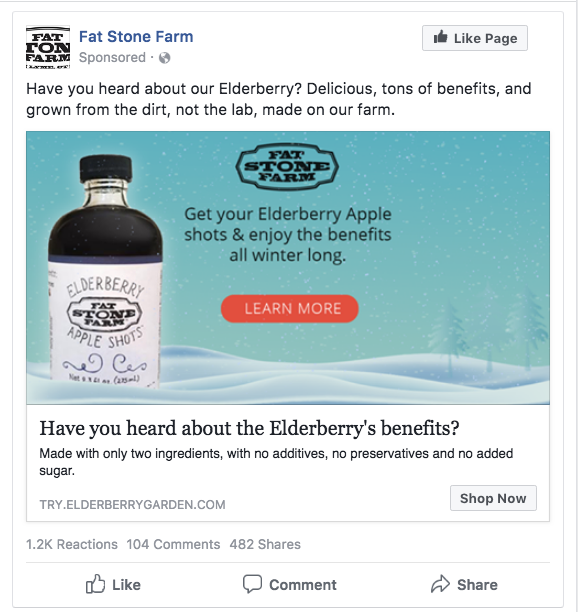 From December 2016 to January 2017, Webistry ran campaigns on Facebook targeting each of the audience segments they’d identified might be interested in the elderberry shots. Pictured above: the ads Webistry ran to the associated landing page. 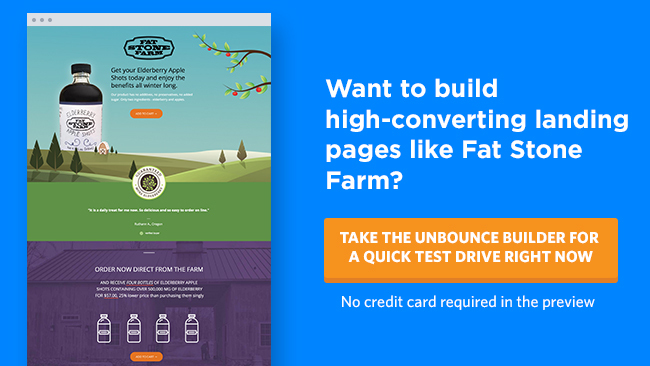 Notice the benefit copy from the ad headlines is carried through to the Unbounce landing page. Click to see a larger version. Two months into this campaign, return on ad spend was 1.66X, and cost-per-purchase was fluctuating between $19 and $145. Jonathan knew they could improve upon these early results and began targeting audiences of vegetarians, vegans, healthy eating aficionado, and homesteaders. And so, in April 2017 the agency launched a new landing page campaign for smoothie lovers. Beyond driving sales, the agency realized there was potential for lead capture here too (as a means of remarketing to especially interested prospects later), so they added an on-exit popup to this page. It offered up a free smoothie recipe book and integrated with a Mailchimp autoresponder. The smoothie campaign helped drop cost-per-purchase down to ~$9.65, and Bill and Liz saw a return on ad spend of 3X from their initial investment after just five months of executing this strategy. 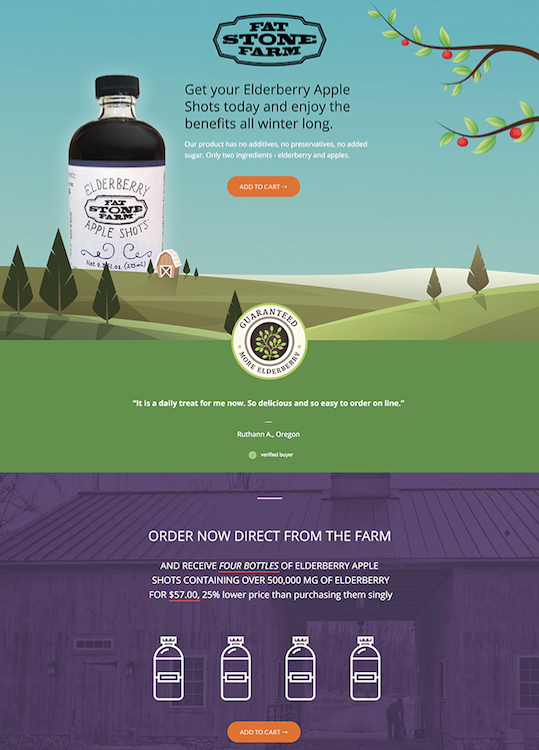 This was great, but Webistry wanted to help Fat Stone Farm stay present in their potential buyer’s world year round. They could lie low waiting for winter again all summer, or they could start developing highly refined retargeting and lookalike audiences to reach all year long. In May 2017, continuing in the off-season, it was time to start preparing for their next winter. 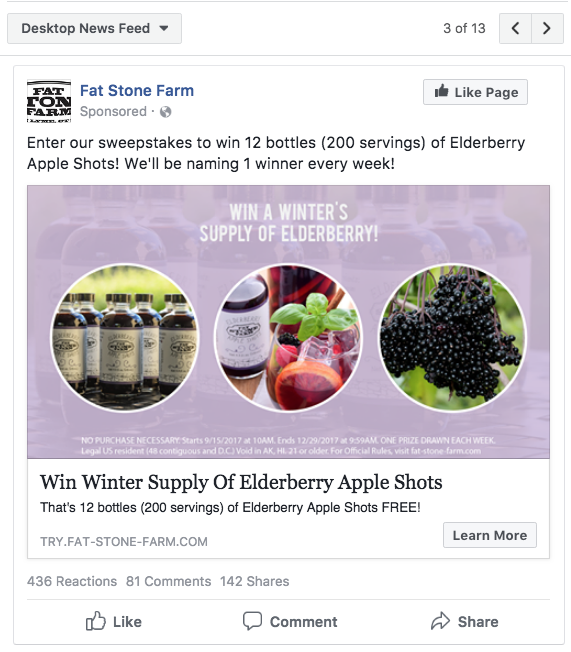 Fat Stone Farm was seeing major benefits from refined Facebook audience targeting, so Jonathan and the team extended this strategy with sweepstakes. They used weekly sweepstakes as a means to gauge and track prospect’s interest in the products, then later in the winter, they created Facebook lookalike and retargeting audiences to get in front of similar groups of interested people regularly. That is – those who didn’t win each week were offered access to another sweepstakes prize (either the breakfast pack or gummy pack product). This helped introduce prospects to other Fat Stone Farm products and gauge interest for these versus a complementary offering like smoothies. Click the image above to see the full landing page. Of the people who clicked through on the Facebook ad and reached the first landing page above, 18.79% converted. Moreover, of the people who did not win the first sweepstakes, but clicked through the email announcing the second sweepstakes, 79.55% converted via the landing page. Hot tip: Webistry embedded a third party tool called ViralSweep on these pages. It’s a sweepstakes application to help manage entries, select a winner at random, and allows people to win bonus entries by referring friends via social. 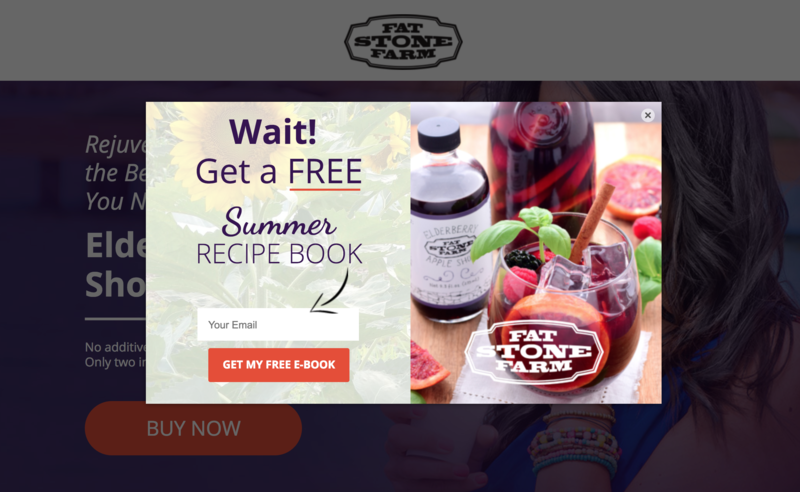 Not only did this campaign collect over 15,000 relevant leads that Fat Stone Farm could remarket to year long with terrific offers, but it reduced cost-per-lead down to a mere $0.51. After all the ad testing, landing page alterations, and lessons along the way, Webistry re-launched the sales campaigns using six months of audience-segmented data. 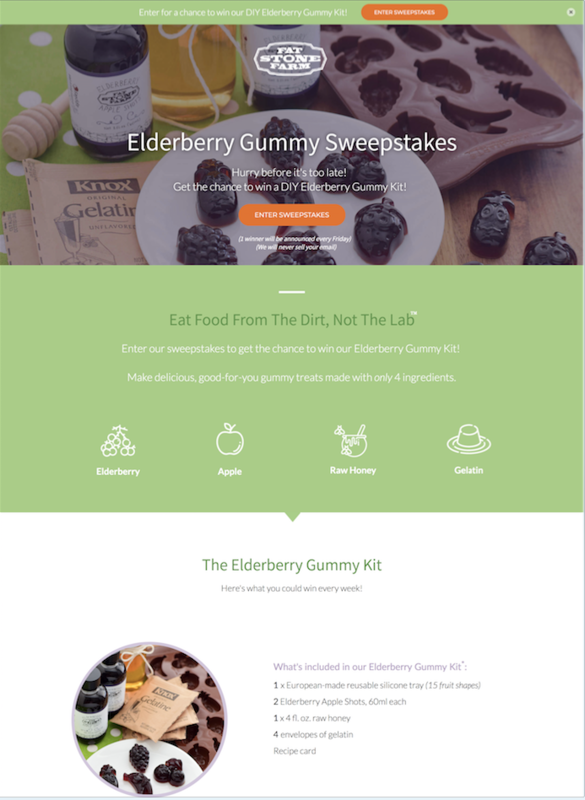 They launched the gummy kits as a standalone product landing page (vs. the sweepstakes page) and continued to sell the Elderberry Apple Shots. The best part? From January to March 2018 Webistry achieved the highest return on ad spend for Bill and Liz since starting to work with them: a whopping 33.12X. Additionally, this season they saw the lowest cost-per-acquisition of just $1.55.